White kitchen taps are a striking choice for the modern home, and if you have been searching for low cost white kitchen taps, you have arrived at the ideal online stockists for your needs. Our chosen designers have encapsulated the true meaning of modern domestic style with their range of white kitchen taps. Opt for something different and install the Astracast Targa white kitchen taps, or combine the sheen of chrome with a touch of white when you select the traditional Belfast bridge model with white tipped taps. Browse the full collection of white kitchen taps. Take style to the next level with our designer white taps collection. If the decor of your kitchen is predominantly white, you may want to continue the theme, ensuring the design flows throughout the entire room, and with our cheap white taps you can do this on a budget. Enjoy great discounts on white taps from Insinkerator, Astracast and Rangemaster in the HC Supplies white taps sale. Take a closer look at our white taps collection and enjoy reading about the specific attributes of each in one in our detailed descriptions. It is important to purchase top quality white taps that will retain their appearance and use for many years. Our white kitchen sink taps have been chosen from reputable manufacturers and designers and are therefore guaranteed to last. Are you looking for something extra special? Consider the 3N1 Insinkerator Chrome and Pearl white taps and enjoy filtered hot water in an instant. These taps give access to hot, cold, and warm water allowing you multiple options for cleaning and cooking. Select the perfect white taps for your new kitchen right here at HC Supplies. Our experienced teams are here to help in any way they can, and if you have any queries about our products, we will be happy to answer them. Simply give us a call or complete the user-friendly online contat form and we will contact you as soon as possible. 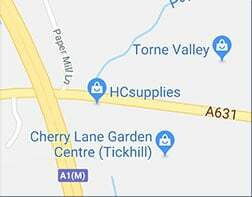 In addition to our comprehensive online store, we also have a showroom in Doncaster, where you are invited to take a closer look at our products.